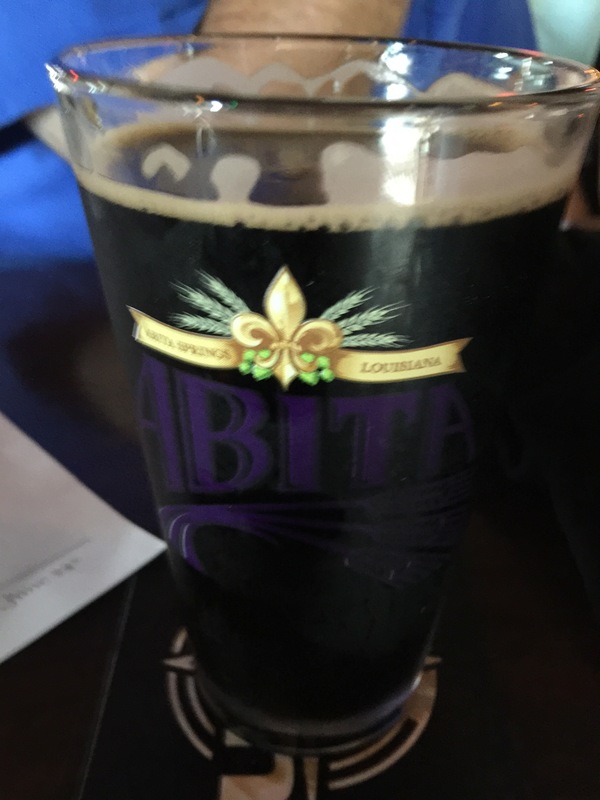 The Curative Powers of… Supping Suds with Philosophiers! This last work week was not one of the best of weeks for me. Mondays are never usually great to begin with, but Tuesday through Thursday I was suffering from a bout of sinus headaches that not only made it very difficult to concentrate on what I was doing, but was also responsible for canceling a night out with friends mid-week. Then, though I was feeling better physically on Friday, I had a bomb drop on me at work that not only affected me professionally but personally. I was literally fuming most of the day and by the time I left for the weekend I was not any happier about what happened. This was not some trivial little slight or misunderstanding. This was a decision by an outside party that not only affected me, but a good friend as well. And there was nothing that could be done about it. That was the maddening part of it, the part that stuck in my craw all day. I was unable to affect the outcome in any way or aspect. I won’t go into the details of what happened here but angry doesn’t quite capture how I felt all day. Freaking pissed off was more like it! But the time I got home I was still angry. I needed a way to vent my anger and I wouldn’t have been above starting a fight with someone just to do that. I haven’t been that ticked off in a long time. Luckily for me the Doctor sent me a prescription in the form of a text message showing me where he was at (see below). I replied that I would be on my way as soon as I gave Tucker his walk and changed clothes. I was about to text the rest of the group when the Maestro sent out a group text inquiring where happy hour should commence at. Not long after Rowdy chimed in as well. After a few back and forth texts we all agreed to meet at the prescribed location. On the way over I encountered the usual Friday afternoon traffic when trying to get to that side of town. And with my state of mind of course every other driver on the road was an idiot and the expletives were flying out my mouth at a rapid pace. Luckily school is not in session now and what would normally have been around 45 minutes to an hour to drive a few miles was really only about 20 minutes. There was plenty of parking near BrassTap and in a short time I was inside ready to order. One of our favorite bartenders was on duty and asked what I was in the mood for. I said “BEER! NOW!”. Actually, I probably said that I really didn’t care, I just wanted a beer… then I added something lighter to start with. 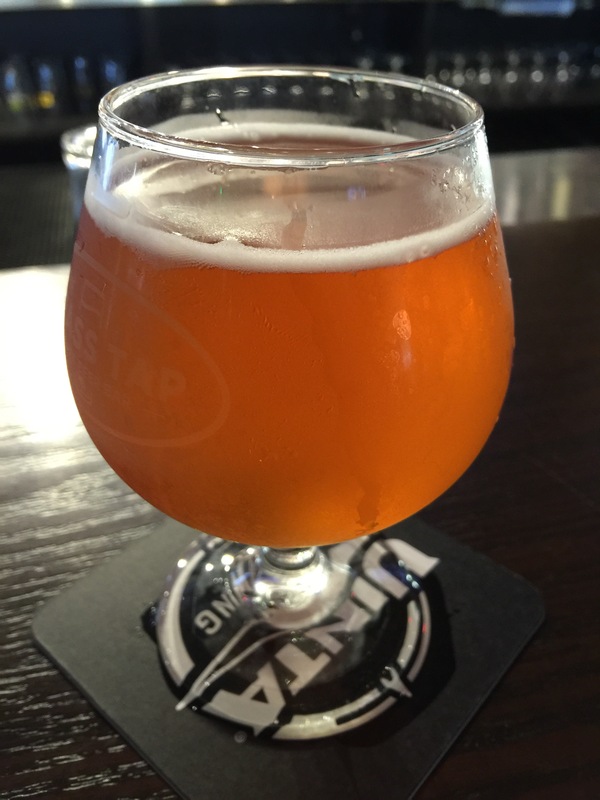 He brought out First Magnitude’s Strawberry Gose and it was a nice beginning for a calmer weekend. The Doctor was not at the bar when I arrived but his hat was so I knew he would be back shortly. And sure enough he walked around the corner and greeted with his usual greeting. Not long after the Maestro arrived and the three of us greeted each other, then Rowdy and the Cooler showed up and it was time to get a table. It turns out that a lot of us had weeks from hell. I won’t go into specifics, and I really don’t want to dwell on that aspect any longer. 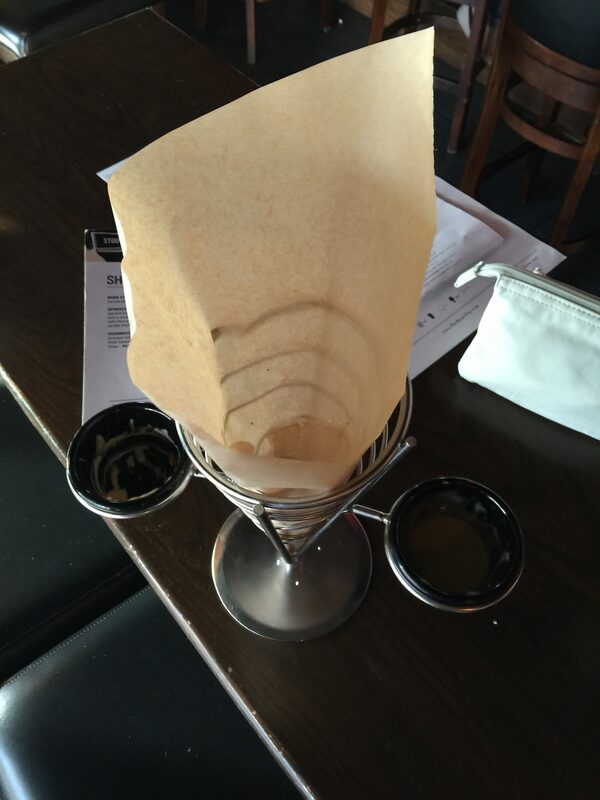 What happened next though demonstrates why folks call it happy hour. It’s not because of drunken revelry or any form of debauchery. Nor is it from the specials of food or drinks that flow at that time of day. 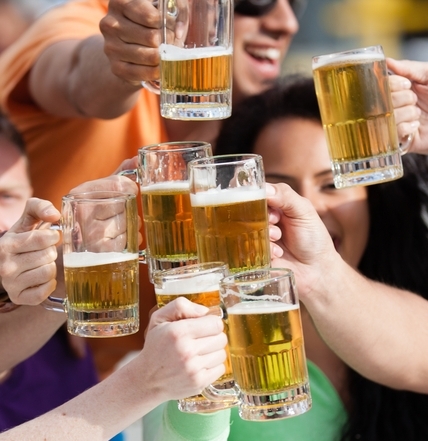 Happy Hour is called so because you’re getting together with friends, cohorts, comrades, fellow revelers and enjoying the company of the moment. We all had crappy weeks but we didn’t talk about that. We talked about the trips some had been on, the ones that some were taking in the near future and the ones we would like to take down the road a ways. Rowdy is traveling to Cuba to visit an area where sea turtles nest. The Maestro and the Muse are traveling to Oregon. Since Rowdy is out of town the Cooler and I will be going to a wine pairing dinner with some other friends, and we tried talking the Doctor into coming with us. The Maestro mentioned a Viking Cruise sometime in the future that starts in Bavaria and continues into Prague, which I said to count me in for. After a couple of beers Rowdy got a call from one of her Roller Derby cohorts and before long Jaded Jester joined us for some revelry. Most of our party also went next door to Chipotle and got some form of dinner and brought it back to the bar to enjoy it. I just staved off hunger with some pretzels bites and both a cheese and a mustard dipping sauce. Throughout the night we didn’t dwell on any of the negative that we had to deal with all week, we instead focused on the future and our friendships. 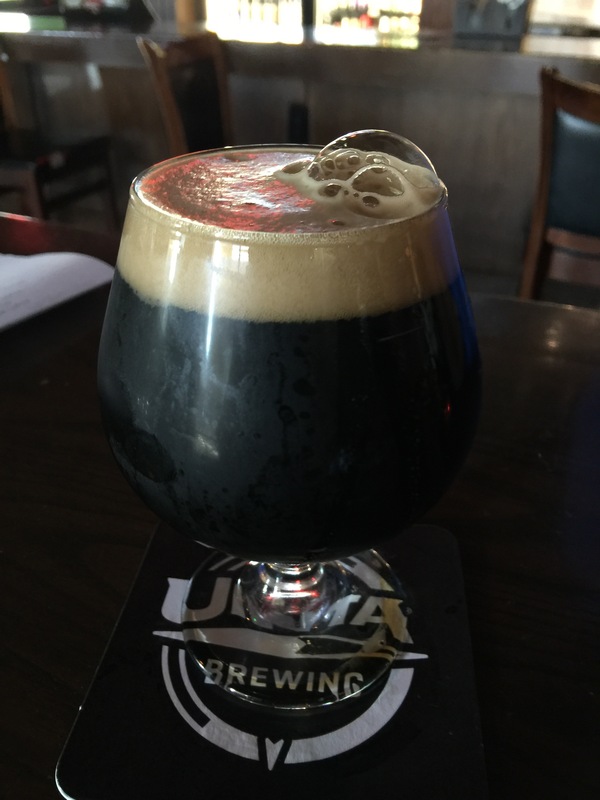 While there I had a recommendation from the bartender for the Organic Monkshine Belgian Style from Uinta Brewing, which was pretty good. And I also selected the Chocolate Chili Stout from Sierra Nevada and the Maven Chocolate Milk Stout from Barley Mow. Both were tasty and hit the spot. By the end of the session we were all sated and, I think, in better spirits… at least I know I was. So the Doctor’s prescription actually worked. And this one I can actually share with others. Get out with your friends and enjoy yourselves. 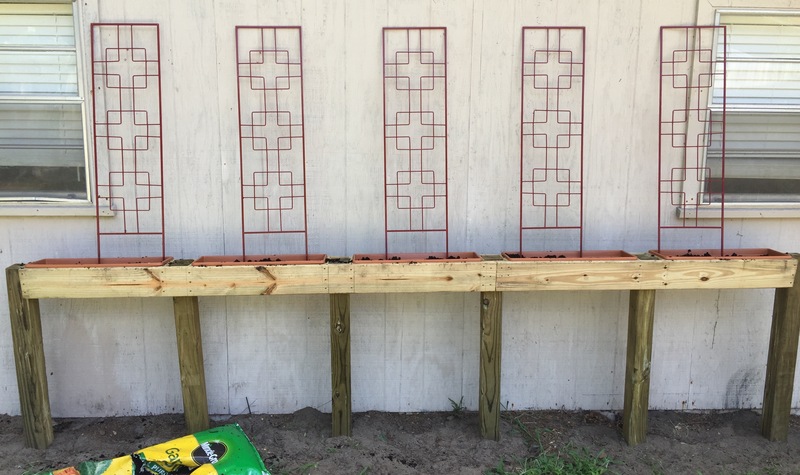 It actually worked so well that the next day I felt ambitious enough to actually build a raised Hops Garden and plant some rhizomes in it (see below). If not for the company of my friends I probably would have just sat around sulking all weekend. 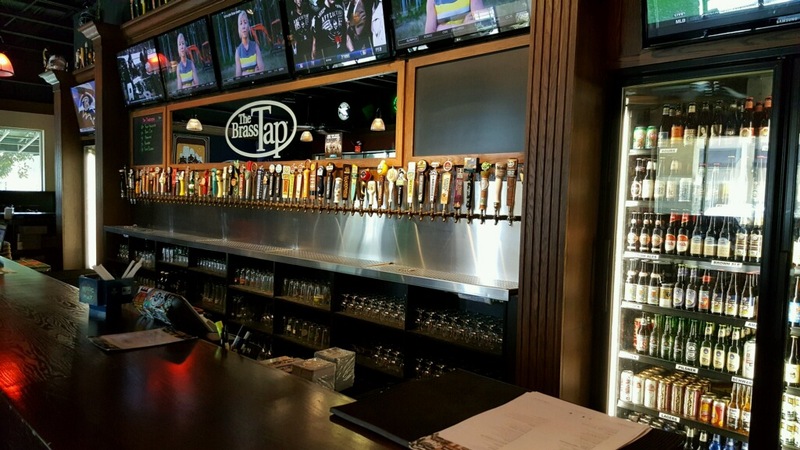 Posted on June 26, 2016 Categories Happy Hour, Tap roomsTags @BrassTapGator, Happy HourLeave a comment on The Curative Powers of… Supping Suds with Philosophiers! 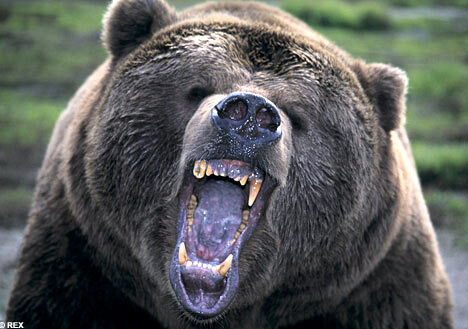 Ahhhh Summer Camp… the phrase draws to mind many different images for many different folks. And those images can vary from person to person and they will vary depending on what kind of camp you went to when you were a kid. There were (and maybe still are) Bible Camps, Math Camps, Music or Band Camps, and of course the scouting related camps. 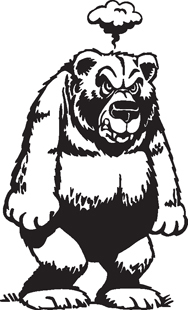 Kids playing pranks on each other and the camp counselors, parents getting a respite from the duties of parenting all the while worrying about their kids getting poison ivy and bee stings or some other summertime ailment. I went to some scout camps when I was very young, then when I got into my teens I went to fishing camps with friends and their families. I always enjoyed getting away from home, not because home was a bad place but because it was something different. And some great fishing for Crappy and Bass takes place in upper New York, Black Lake to be specific, and all throughout Pennsylvania in the summer time. 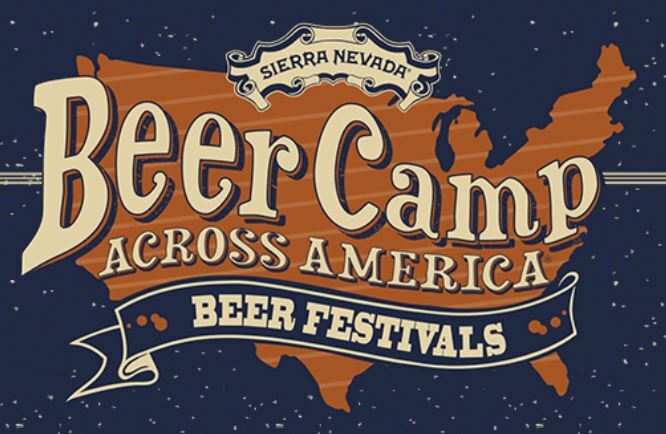 So imagine my joyful glee at hearing that Sierra Nevada was hosting a BeerCamp in six different cities throughout the country this year. And one of them was actually close enough for me to attend. The overall concept was that 31 different breweries would get together and make six different collaborative beers representing different regions of the country. Then they were to host a beer festival in each region to show off these beers and invite a lot of different breweries from the area to show up and show off their wares. 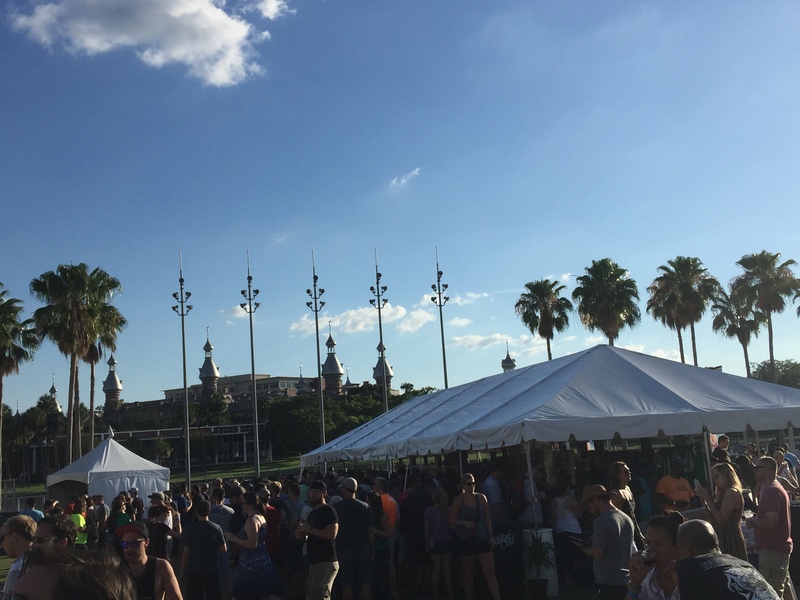 The first BeerCamp to be held this summer actually took place yesterday in Tampa, FL. Some of you may be asking why Tampa? 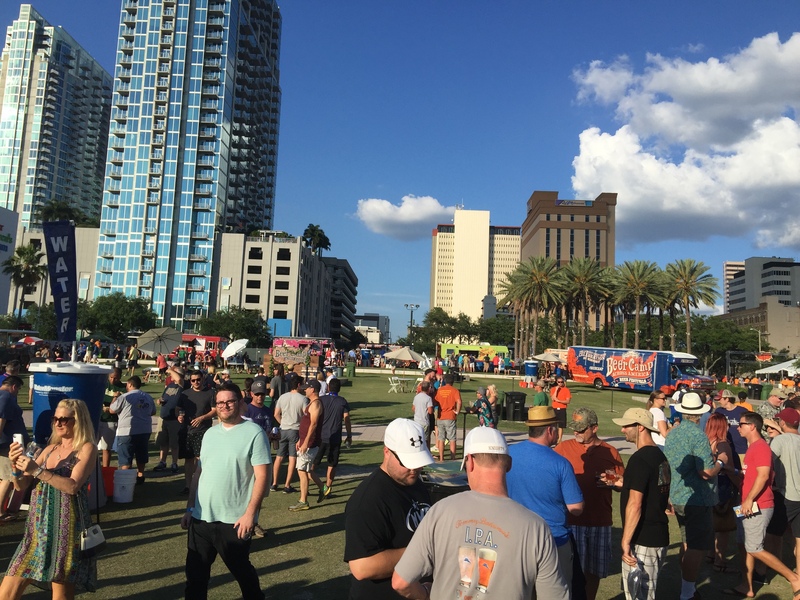 I would reply “Why not Tampa?” If you haven’t been to Florida then you are missing out on well over 100 breweries (that could be over 200 but I didn’t want to exaggerate) many of which can stand up to most of the other brewers in the country. 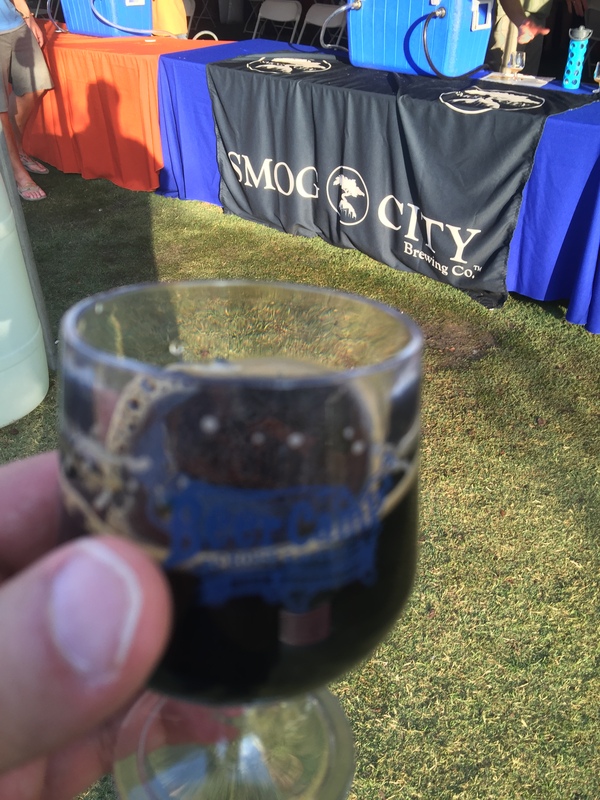 The greatest conglomeration of breweries in Florida is around the Tampa area, so it makes perfect sense to those of us who live here. 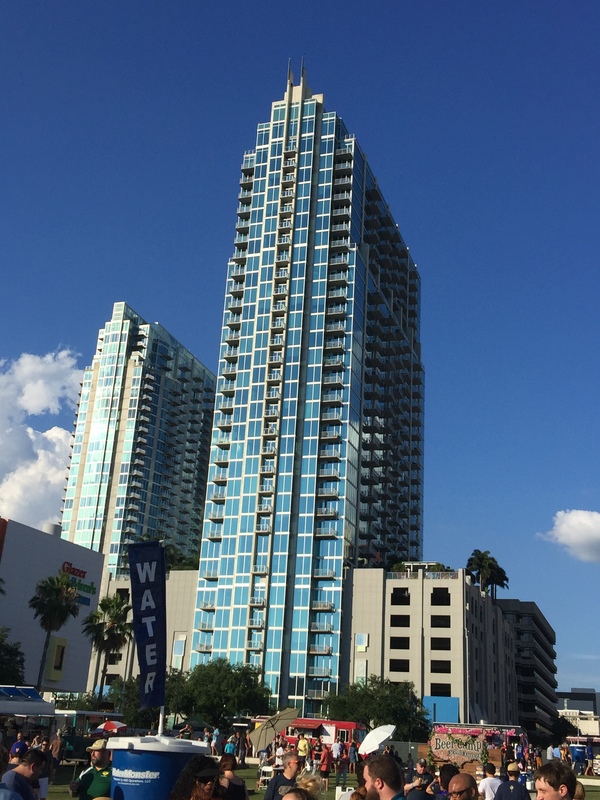 The event was held at the Curtis Hixon Park which is on the west part of Tampa along the Hillsborough River. Not having been there before, but to other venues in Tampa, I have to say this was an excellent location for this event. 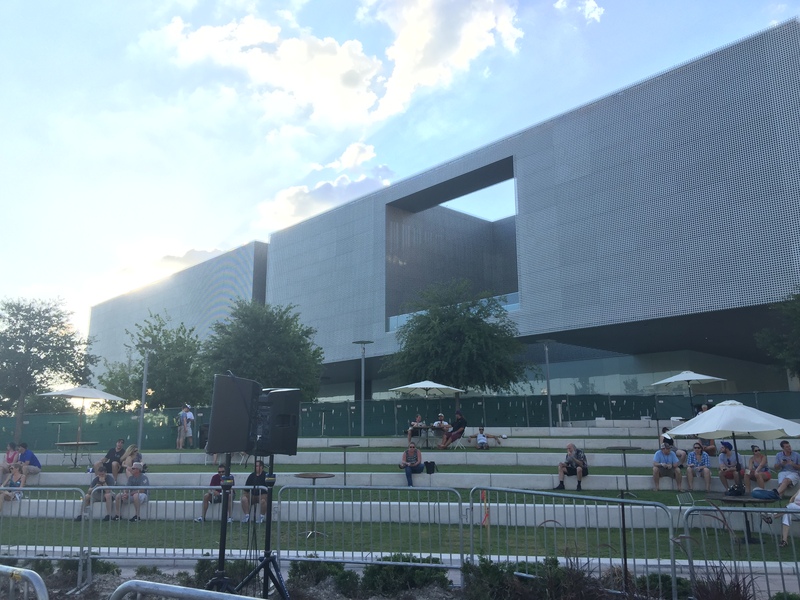 It is located near many other venues, has access to public transportation, and has a natural amphitheater built into the site. And the views of the river walk are great! 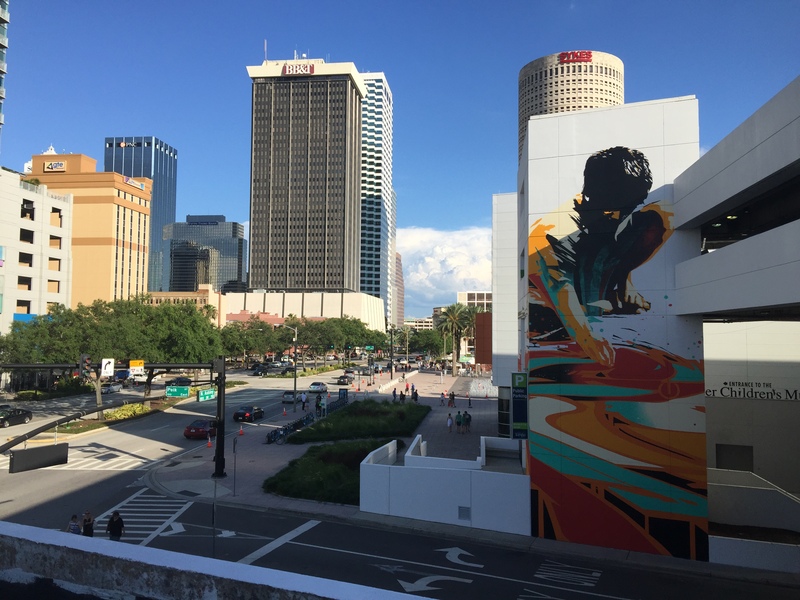 Panoramic shot of the River walk from Curtis Hixon Park. 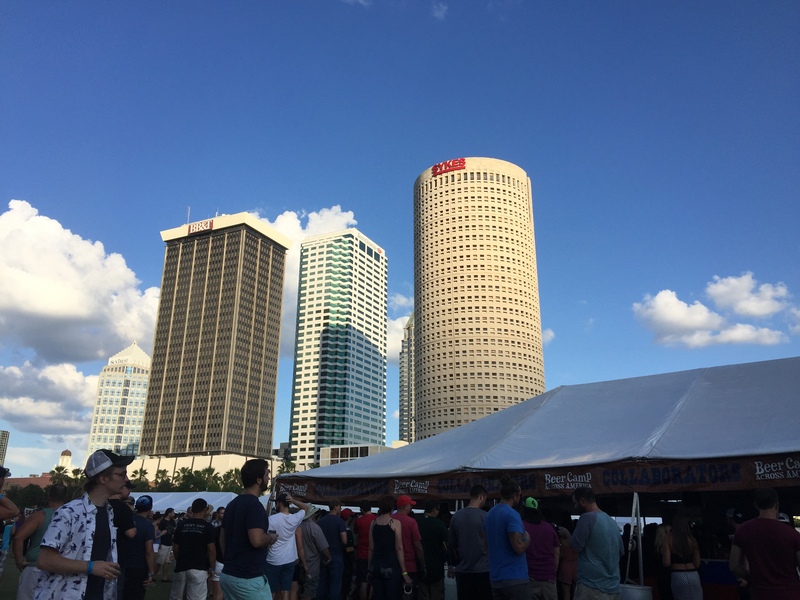 Having been to a few other Beer Fests in Tampa or the surrounding area this time I planned in advance and scouted out for nearby parking. And luckily practically right next door to the park is the William F. Poe Parking Garage. So instead of setting my iPhone map feature to the event I mapped out getting to the garage instead. Looking from the parking garage south you can see the entrance to the park and the BeerCamp in the middle of the picture. 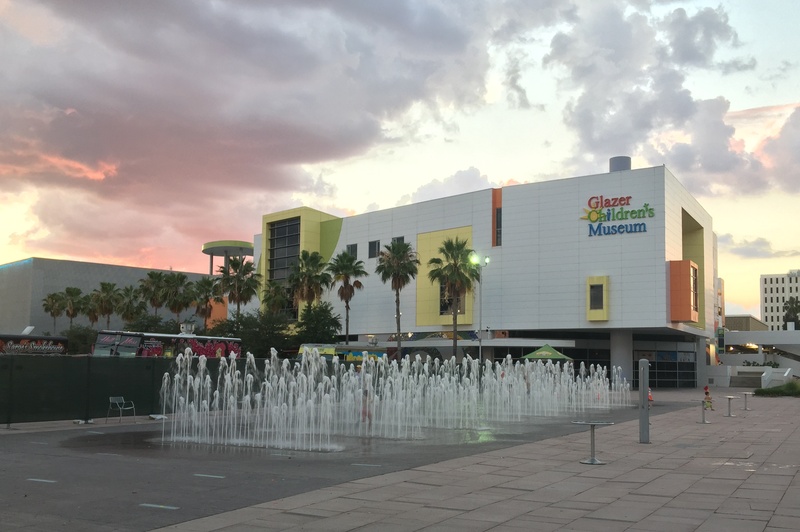 The park itself is surrounded on three sides by tall and/or architecturally interesting buildings which provide a scenic surrounding even when you are not looking at the river. 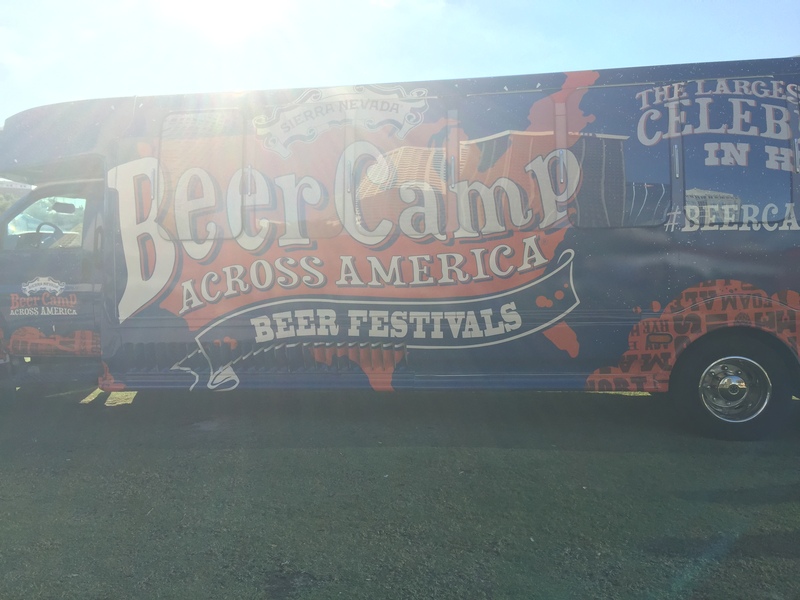 Once you entered BeerCamp you immediately lay eyes one of the best party buses ever. 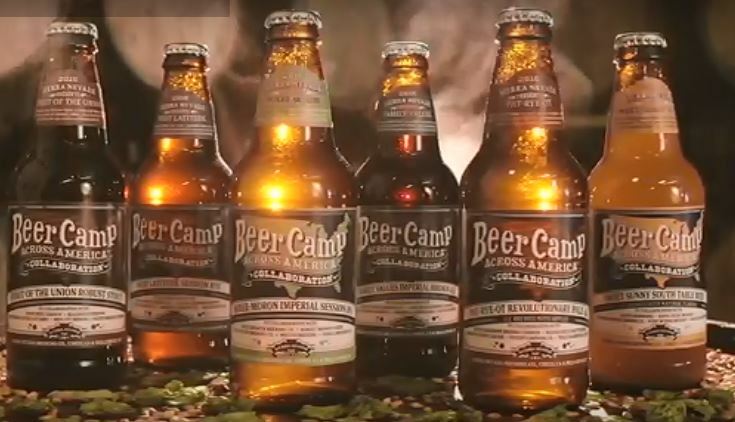 Obviously a customized paint job, I will bet that this beauty will be at all of the BeerCamps. What lucky S.O.B. has the job of driving it and who do I have to bribe to get his job? Nearby were the food trucks which numbered probably around a dozen. And on the other side of the bus were the beer tents. They had four large tents altogether, which housed the many brewery vendors. Also nearby were large vats of fresh water for folks to drink and rinse out their glasses, a stage featuring a band performing the whole time, a splattering of high top tables throughout the grounds and off to the side was a bank of porta-toilets. The place was packed with folks there to sample the various beers. But even with the large crowd you didn’t have to wait long to get to most of the breweries and sample their brews. There were a few exceptions, one or two of the breweries seemed to have a long line to get a sample, and there was a line for getting your picture taken at the BeerCamp display, which is why I don’t have one. I didn’t take pictures of all of my samples only a few, but those and some others are definitely worth a mention. Big Storm Brewing’s Oats in Hose Oatmeal Stout (pictured below left), Cigar City brew Pub’s Space Race Imperial Russian Stout, Smog City’s Coffee Porter (pictured below right), and the collaboration Stout of the Union all were great examples of a good Porter or Stout, with the Space Race winning by far out of the group. 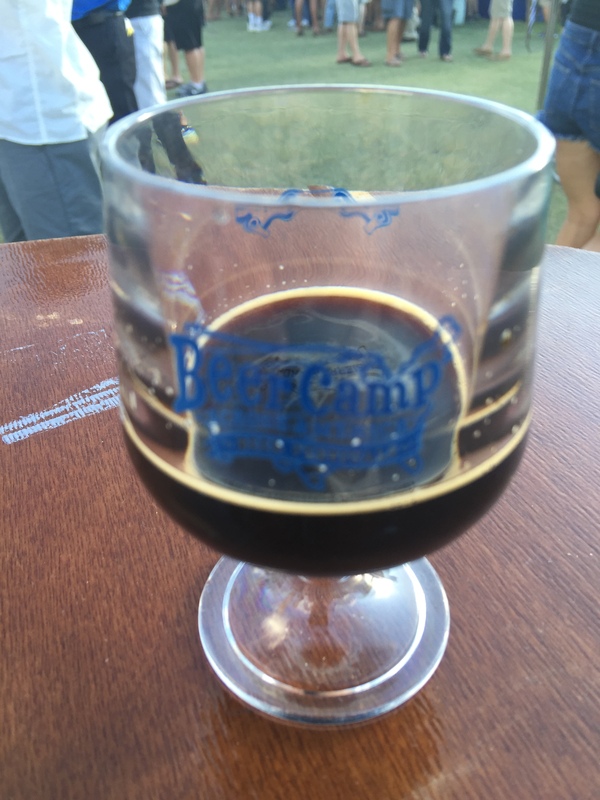 Hourglass Brewery’s Beatrijs Belgian Dubbel with Gooseberries, Brew Hub’s Diver Down Red Ale, and Wynwood Brewing’s Guava the Hut a Berliner Sour Ale (pictured above), all came across very well too. 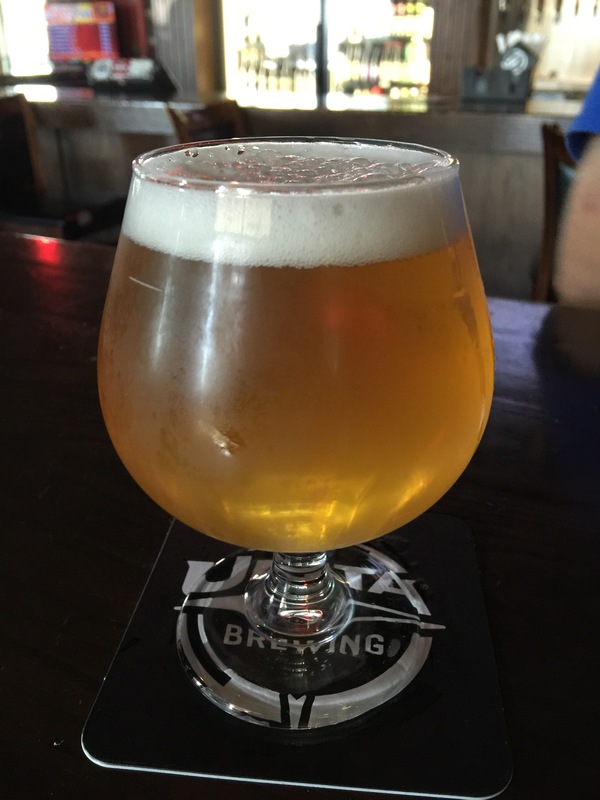 I also want to give credit to the Tampa brewer’s Guild collab Guildy by Association which was a really refreshing Saison which hit the spot on a hot summer evening. Food trucks all had long lines at them and nothing at them really seemed to tickle my fancy when I looked over the menu. Except the last one which didn’t have a line, probably because it was the furthest away from the beer. 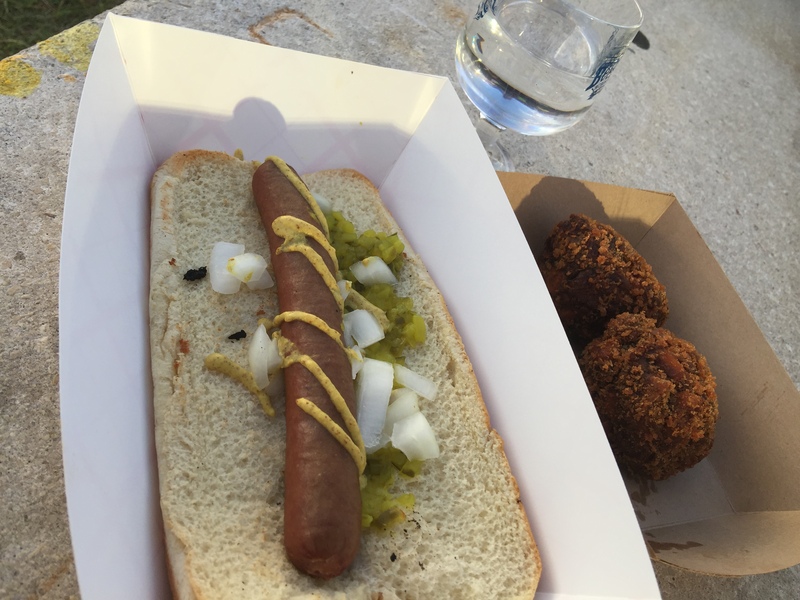 The Red Line Truck had three items on their menu: Korean Beef Lettuce Wraps, Hot Dogs and Sweet Potato Croquettes. All three looked good to eat, but I ordered a hot dog and a side of the croquettes. The hot dog had a good flavor and they didn’t drown it out with condiments, jst enough to enhance it. And the Sweet Potato croquettes had a goat cheese center that made it creamy as well as sweet. If you’re in Tampa and see this food truck again I highly recommend it. 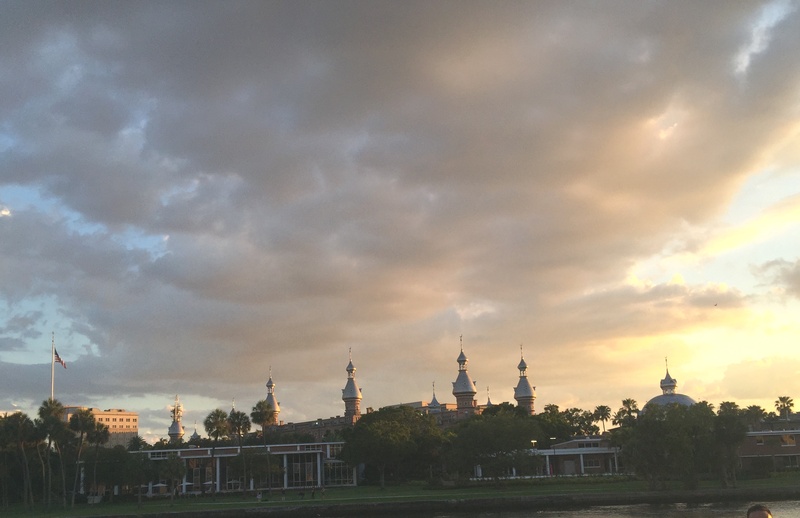 After a couple of hours of beer sampling and sweating in the evening sun I decided to head out, but not before taking a last look across the river at the minarets for the University of Tampa reflecting the light on the sunset. 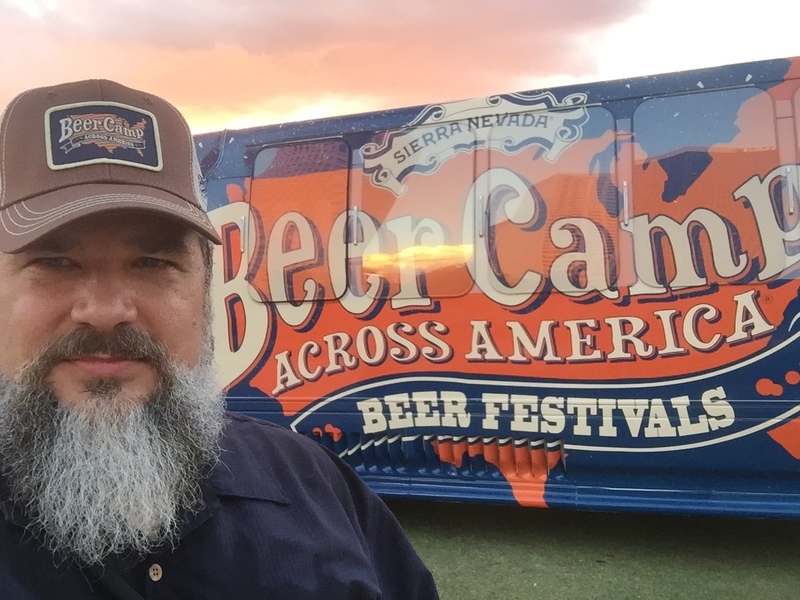 I also grabbed a selfie with the BeerCamp bus and took a pic of kids playing in the fountain outside the children’s museum which is beside the parking garage. 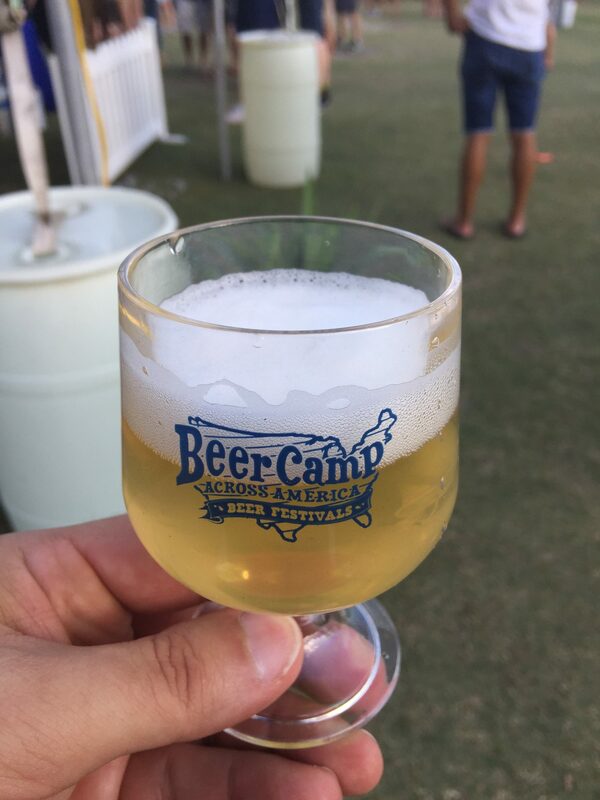 BeerCamp was great. The venue selected worked great and the various vendors all had great beers and foods to sample. Too bad it didn’t last a week or more like the camps did when we were kids. I certainly hope they hold more of these next year. I would definitely attend it again. The only change I might suggest is allowing pets. Tucker doesn’t like it when I leave him at home and insists on showing me how much he missed me when I get back. 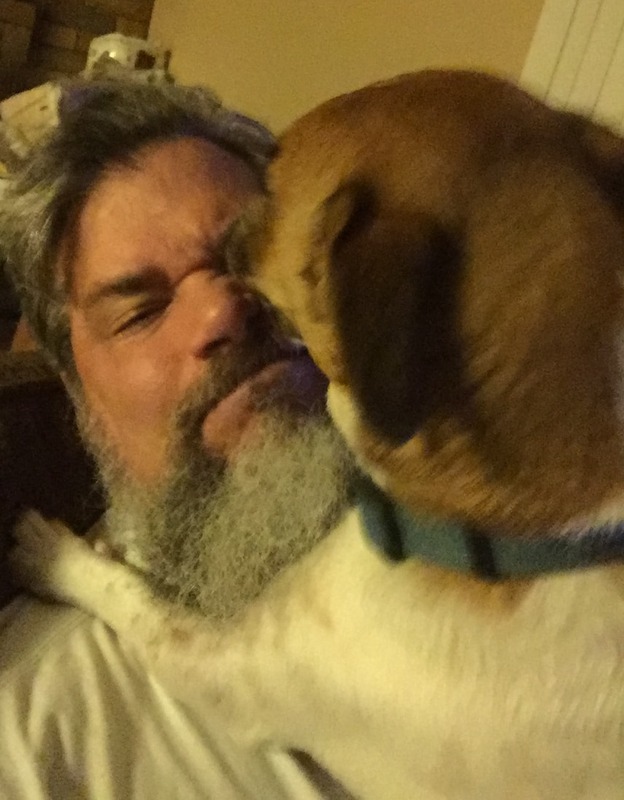 Either that or he’s trying to get some beer and food samples out of my beard.